When I showed up at the YouthBuild charter school in Boyle Heights yesterday, I expected to be doing a story to promote a mural unveiling and community health fair. I had heard students had painted a mural that would be placed in Hollenbeck Park and thought it might be interesting to learn about the motivations for the project and their aspirations for the park. What I came away with was more inspiring than I expected. Many of the students at YouthBuild are non-traditional. They may have dropped out of their previous high schools because they failed out, got into the wrong crowd, lost motivation, were incarcerated, or became pregnant and needed to work to support their new family. At the school, they get a second chance to finish their degree while also being exposed to ways to get involved in promoting social justice in their community. The combination of the two helps many who felt overlooked by their teachers or without purpose find meaning in their ability to contribute to making the area a better place. The mural, for example, which will be unveiled at the “La Cultura Cura” (Culture Cures) fair Friday afternoon, was originally intended to be a permanent installation that would beautify the band shell at Hollenbeck Park. The project is an outgrowth of an informal weekly dance party created by friends Luis Anguiano, Carlos Hernandez, Javier Torres, and a few others and held at the park. Last summer, they had started bringing speakers and equipment into the park to to play music for their friends, Anguiano (a DJ) told me. It grew into a larger dance party from there, attracting people from across Los Angeles and beyond. The dance parties had been especially good for Javier Torres, a student in his early 20s who credited dance with helping him leave drugs and other unhealthy activities he used to engage in behind. Better still, he says, some of the police officers that used to harass him changed their attitudes when they saw him dancing at the weekly events and at Summer Night Lights, helping little kids learn steps. He hadn’t realized how much he had changed their minds, however, until they pulled up next to him one day and told him to get in the back of the police car. Not because they were going to arrest him, but because they wanted to take him out to lunch. “Yeah,” Torres agreed, looking deeply affected by the gesture. He was clearly proud that someone finally believed he was a good person making a contribution to his community. The park management, on the other hand, was not particularly thrilled by this impromptu gathering or the fact that they were using the park’s electricity to run their speakers, Anguiano said. The authorities even went so far as to cut electricity to the stage to shut the parties down at times. After much negotiation, and with the support of law enforcement, they managed to convince park management that they were doing no harm and were even working to keep the park clean. If taggers jumped up on stage to mark it up, organizers would shut the party down and tell the audience that was not what they were there for. Drugs and fights were not tolerated, either. In fact, the youth were able to get help from some of the local gang-bangers in removing knuckleheads who were determined to fight because even the gang-bangers realized the party was a positive thing. Inspired by their success, Anguiano and friends contacted the parks department and Jose Huizar’s office trying to get permission to paint a mural on the band shell to beautify the area. Unfortunately, the bureaucracy proved to be too formidable of an opponent. The city spends so much money and time scratching out graffiti, Anguiano said, confused. Why not let the youth do something positive that the taggers would likely respect? It wouldn’t cost the city anything and everyone would benefit. How could the city not be in favor of the project? It was true, their teacher Canek Vargas told me as he put the finishing touches on some of the figures in the mural. The permit process had been too much of a hassle and they had had to settle on doing a mobile mural instead. That would allow for murals to be changed out of the park and for them to build an archive of murals created by students over time. But, it was still disappointing that one of the lessons the kids learned from the project was that city bureaucracy can get in the way of people making positive change in their neighborhood. That said, the mural is beautiful and will make a great addition to the park, even if it is a temporary one. Congratulations to all who worked on it! Want to see the mural in person, enjoy live music and dance, participate in a health workshop, or meet some of the artists? 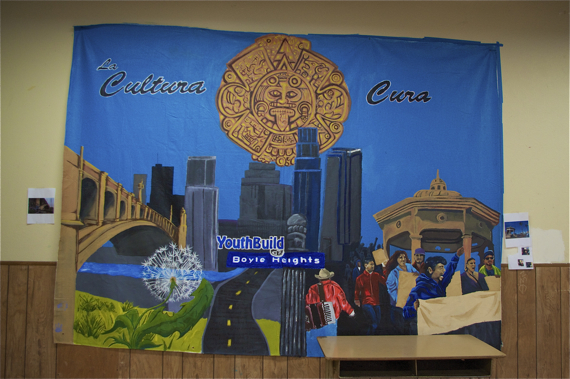 Check out La Cultura Cura tomorrow from 3 – 7 p.m. at YouthBuild, located at 202 N. Saratoga St. in Boyle Heights. What a great article! Thank you for telling our story. Also, thank you to Corazon del Pueblo, La Chamba Cumbia Chicha, Musician Corps, The Coalition to End Sheriff Violence in LA Jails, Proyecto Jardin, the East LA Womens Center, GRYD, Building Healthy Communities Boyle Heights, The California Endowment and all other groups that have helped us this year! ALSO, THE FIRST 50 PEOPLE AT OUR EVENT WILL GET A FREE BIKE PATCH KIT! Can’t wait to check out the event today. This is a terrific write-up about the work these students and their teachers have done for their community!